In 1996 George Shaw (born UK, 1966), started to draw and paint scenes of Tile Hill, the housing estate in Coventry where he was born and grew up. He walked the streets and pathways near his childhood home taking hundreds of photographs. 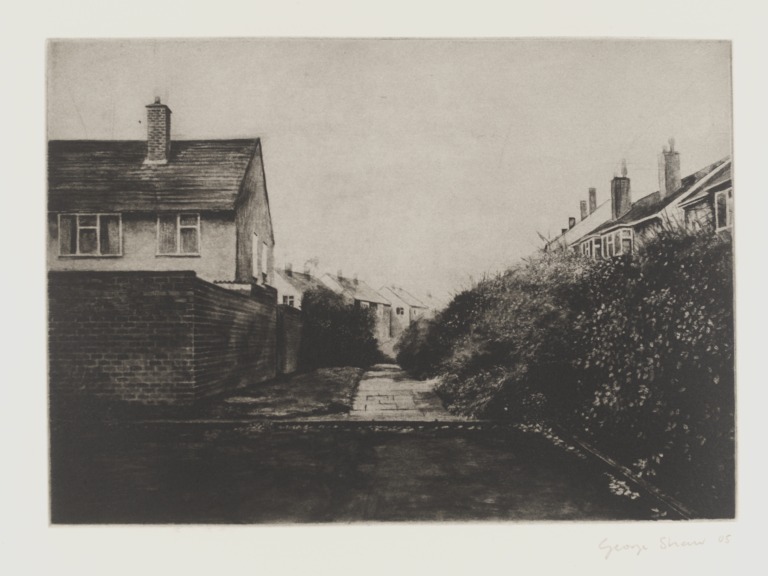 From these a number were selected and through Shaw's superb draughtsmanship transformed into this series of twelve atmospheric etchings, entitled 'Twelve Short Walks'. Shaw no longer lives in Tile Hill, but he still produces pictures of the area which convey a sense of nostalgia for his lost childhood. In Shaw's words 'the sum of the work fills the empty space that you leave behind when you die'. The sites he chooses to represent are the very opposite of traditional landscape subjects - no open vistas, no lush fields or verdant woodland, no elegant buildings; instead he focuses on the overlooked, the narrow in-between spaces, the non-descript 'nowhere' places, weeds, scrubby vestiges of woodland, the backs of houses, garages, on walls, railings and the edge of things. The sepia-tinged monochrome he has chosen to work with amplifies the sense of neglect, of ordinariness, and uneventfulness, a place where nothing is dramatic or distinctive, but a place which, for the artist, has the pull of something familiar and formative, emblematic of continuity and stability - a place with which he identifies and sees as home. Shaw was shortlisted for the 2011 Turner Prize and Adrian Searle wrote in The Guardian as follows: "Somewhere, on an English housing estate, it is always a George Shaw moment - a dull Sunday or a walk-the-bloody-dog empty afternoon. His paintings of 1960s estates and hinterlands are defiantly local and prosaic, but probably look exotic and poetic to viewers from abroad. And there is something Larkinesque - as well as Hancockesque - in his work. Perversely anachronistic, at his best he achieves a kind of universality. The tedium in Shaw's dutiful technique matches the places he depicts. To describe this as minor art also catches the mood exactly." Monchrome view of houses on an estate, with a house and a brick wall in the middle ground to the left and an overgrown bank of shrubs partly concealing a row of houses on the right; an empty patch of tarmac in the foreground. 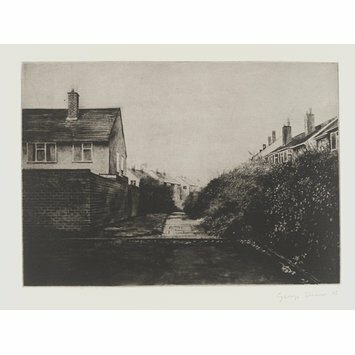 Etching by George Shaw, entitled '07', from the series 'Twelve Short Walks', Britain, 2005.